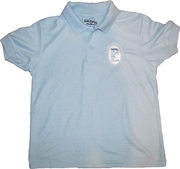 This polo features her New Oval Logo embroidered over her heart. The shirts are cotton pique with great texture. They look so nice! Add your Pearlette's name or chapter too! Have up to 20 characters embroidered under the logo or on the right side of her shirt. They are the perfect shirt for a chapter uniform!